As I hiked the upper stretch of the Shut-Ins Trail at Sam A. Baker State Park in southeastern Missouri, I encountered this 2-inch long millipede slowly making its way across the rocks. 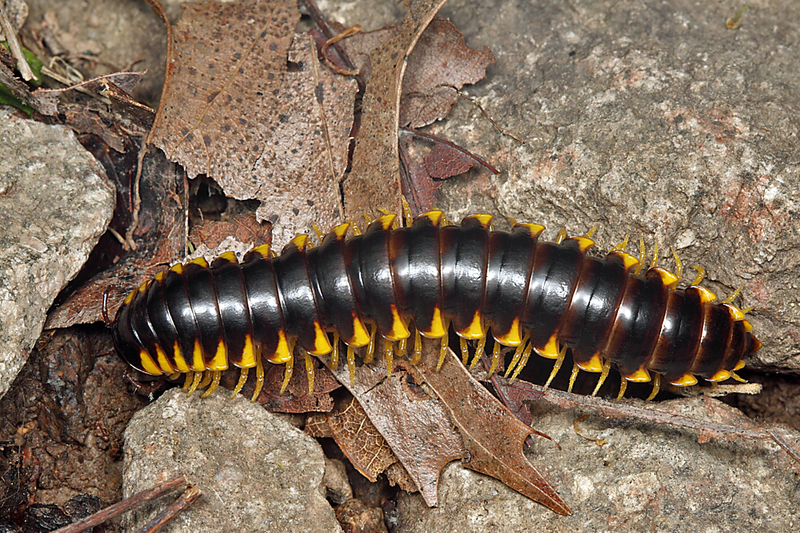 Many millipedes, of course, produce hydrogen cyanide (HCN) as their primary method of defense against predation, and the bright yellow markings of this individual were an obvious sign that this particular species is no exception. The wrinkled dorsal surface and black coloration with yellow wedge-shaped posterolateral markings identify it as a species of Pleuroloma (BugGuide), and of the four species known from North America (Shelley 1980) only the widespread Pleuroloma flavipes (literally meaning “yellow legs”) occurs as far west as Missouri (Shelley et al. 2004). A similar pattern of coloration is seen in a number of related genera, e.g. Apheloria, Boraria, and Cherokia—all belonging to the order Polydesmida, presumably functioning across the group as an aposematic (warning) signal to predators that they should be left alone. Another feature shared by the members of this group is the lateral expansion of the dorsal segments into “paranota,” giving the species a much more flattened appearance than other millipedes with the more typical cylindrical shape. While all millipedes exhibit diplosegmentation (embryonic fusion of paired body somites and associated legs, spiracles, and ventral nerve cord ganglia), members of the Polydesmida have taken this condition to its culmination with no evidence of external sutures (Myriapoda.org). The bright coloration of this species was an interesting contrast to the cryptic invisibility of the copperhead snake I had seen just a few moments earlier during the hike—opposite strategies with identical goals. Defense compounds are, of course, widely employed by many plants and animals; however, only millipedes and a few insects have developed the ability to utilize HCN, a highly toxic compound that halts cellular respiration in most animals through inhibition of the mitochondrial enzyme cytochrome c oxidase. Evidence suggests that Pleuronota flavipes and other millipedes can tolerate HCN because they possess a resistant terminal oxidase that makes their mitochondria insensitive to the effects of HCN (Hall et al. 1971). Perhaps some of you will be interested in this recent checklist of the millipedes of North and Central America (Hoffman 1999). It could be Pleuroloma flavipes Rafinesque, 1820, or it could be Apheloria virginiensis reducta, I can’t really tell from the photos. Shelley, R. M., C. T. McAllister, and S. B. Smith. 2004. Discovery of the milliped Pleuroloma flavipes in Texas, and other records from west of the Mississippi River (Polydesmida: Xystodesmidae). Entomological News 114 (2003):2–6. This entry was posted in Diplopoda, Polydesmida and tagged chemical defenses, entomology, insects, millipedes, Missouri, nature, predator avoidance, science. Bookmark the permalink. 9 Responses to Do you think I’m tasty? Thanks, Shelly – actually this one was rather cooperative. First time I’ve ever seen something in this group. How does it deliver its defense? Does it spray the chemical? Or is it within the body? Hi Anne – these and most other millipedes secrete the compounds from glands along the sides of the body when disturbed. There are some large Neotropical species that can actually direct a spray of liquid several feet. 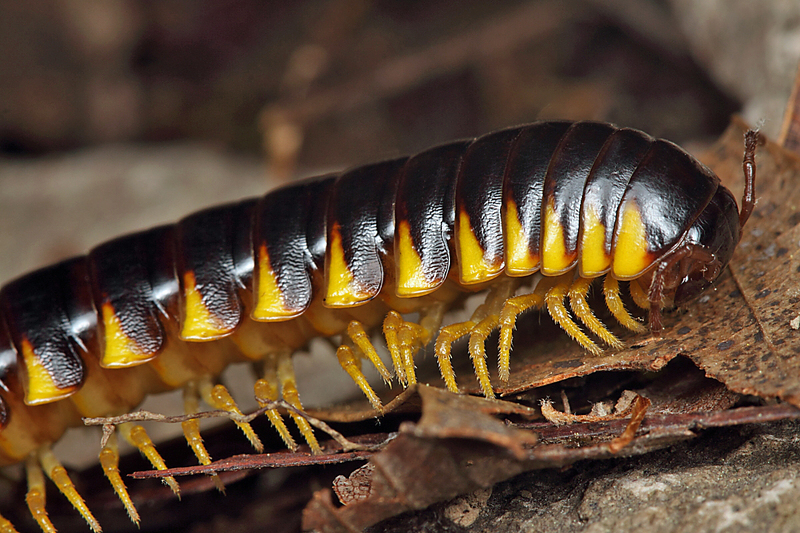 Amazing photos and a beautiful millipede! The family and I were out at Washington State Park in Desoto Missouri walking 1000 step trail an found this milipede on the trail. Took pictures and found this site for identification. That for the information.